Ulster Director of Rugby Les Kiss. THE FESTIVE SEASON can make or break a team’s hopes and dreams for a campaign. Take, for instance, Ulster last season. Having made a decent start to the season, they hit a very tough December schedule and proceeded to lose five of eight games, eliminating them from Europe and forcing them to play catch up in the league. This season, they cannot afford to do the same, with three interpros sandwiched between four European fixtures — a similar run as last year would leave them staring down the barrel of another campaign fallen by the wayside. This season also carries additional significance. Already, opinion in the North has turned harshly against the coaching staff, and arguably only a good run of results will keep Director of Rugby Les Kiss in a job. 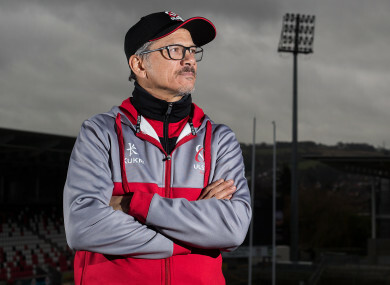 Despite taking 12 points from their last three games, it has masked several issues within the Ulster side, namely a porous defence that has shipped 90 points during the fixtures in question. Former players Stephen Ferris and Neil Best have joined the calls for the buck to stop with Kiss, but the Australian says they’re not going to rise to the complaints. “There is a bit of noise and you expect that and I understand that,” Kiss admits. “We do not respond to the noise, but we want people to know we are a group of people who are doing the right things we believe. I feel for the players, it’s not about me or the coaches. We know our job and we are more resilient we have been through the mill. We feel for the players, a lot more appreciate what they have done than do not, and I really do believe that. “The supporter base here is exceptionally positive a lot of the time. And I would rather focus on that and for young Ulstermen to be lorded for what they are trying to do on a daily basis in a fairly tough environment they should be recognised a little bit more. It is easy to pick out the bits. “I do feel for the guys and I back them fully. There is no way we can question the attitude and what their commitment is. So if Kiss is drowning out the negative noises coming from the disgruntled Kingspan Stadium fanbase, what does he see changing that will keep them onside as the season progresses? There are positives — 13 tries scored in three games and the fact they’re still in touch in Conference B despite not hitting top gear mean if they can hit some sort of form, they’re not starting from far behind. However, they will need to show some improvements on the pitch, starting this week away to Harlequins, but Kiss believes there are signs of encouragement to take from what they’ve been doing. The former Ireland coach added: “I mentioned before about the coaching group what we take from it. The group have been brilliant, worked really hard, been smart and got to know the players we are challenging in a different way. I know the playing group believe in it and that is the most important thing. “What we want to be able to show is hopefully going to grow and if we show the shiny bits all the times and we had the solutions completely now with everything we have, we would have nowhere to grow I guess. I think there is a real special thing the boys are building, we are not going to let up on it. Jono, myself, Dwayne, Aaron and Neil, we are keeping the pressure on them, but it is positive. “That may not be seen all the time, but I know there are a lot of people out there who are saying keep going, there is something special in some of the things that have been delivered. In the meantime, focus shifts from the Guinness PRO14 to Europe and two must-win games against Harlequins for Ulster if they want to stand any chance of reaching the knockout stages. The Irish province will welcome back Rob Herring, Iain Henderson and Jacob Stockdale from international duty for the game, while prop Wiehahn Herbst is back from injury to bolster their ranks. But, ultimately, this game is all about getting the result against a side that come into the game off the back of a morale-boosting victory over Saracens at the Stoop last week and a team who boast a front eight that looks far superior to what Ulster can put out. “You look through the pools and these games are home and away, and it is make or break. It is big for Europe and it is important to understand what it means,” Kiss says. If you can nail the first one, you can put scoreboard pressure across all the pools. We need to go out and apply ourselves on the game, we are trying to build and make sure it works and have that attacking mindset in our game in Harlequins and get the money. “Would you prefer to be at home first? Perhaps, but the opportunity is there to do something strong and make a statement at Quins. “It will not be easy. I was at the game last week over there and they just kept fighting and finding a way to stay in the game against a good team. Saracens may have lost five in a row for the first time in ages, but they were still a very competitive team. Email “'I do feel for the guys and I back them fully' - Under-fire Les Kiss on Ulster's critics”. Feedback on “'I do feel for the guys and I back them fully' - Under-fire Les Kiss on Ulster's critics”.